There’s a lot to react to after reading an issue like Amazing Spider-Man #667, which marked the “official” first part of the anticipated “Spider Island” story arc. 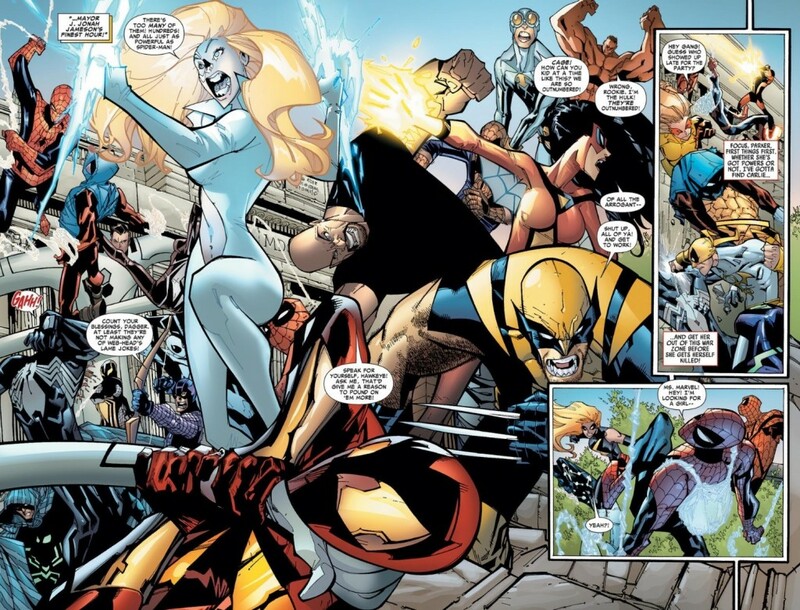 Nice storytelling by writer, Dan Slott, neat comic book art from Humberto Ramos, whose more “cartoonish” style I think is going to mesh well with the chaotic circumstances that are slated to unfold. 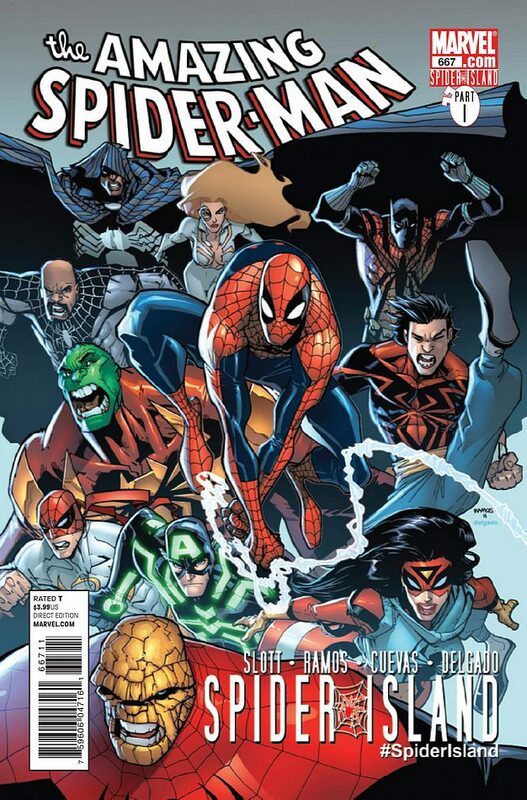 It looks as if this arc is going to tie-in to some classic themes from the Spider-Man universe. The old stand-by “with great power comes great responsibility” mantra gets a neat little twist at the end of this issue as the “real” Spider-Man lays badly beaten among a sea of Spidey imposters and Madame Web comments that Peter Parker/Spider-Man’s great powers have essentially be rendered moot in a world where average folks have inherited spider-powers (but none of the responsibility) thanks to a virus being spread throughout New York City by the Jackal. But what struck me most about this issue is how Slott goes about encapsulating nearly 50 years of ASM history within one issue. Through numerous winks and nods, some subtle and others not-so-subtle, the reader gets the sense that Slott is crafting his very own definitive ASM story that’s both self-aware and tongue-in-check. I think that integration of the past is vital in giving Spider Island a truly “special” feeling. Not only is Marvel putting forward something new with consequences, but those consequences are built upon decades of generally well-thought of storylines that have preceded it. For example, Mayor J. Jonah Jameson getting together with his cabinet as the spider-powered infestation is spreading and finally, after years of crafting every kind of lie and conspiracy imaginable in order to paint Spider-Man as a “menace,” believing he’s been vindicated for his dogged and obsessive slams of the superhero. Despite not being super powered, JJJ has long been the perfect foil to Spider-Man, using the power of the press and now the power of government to beat down Spidey in a way he’s never truly been able to successfully counter. It’s part of what’s made JJJ one of Spider-Man’s most troublesome opponents, despite never being able to physically overpower him. That’s why it’s great to see JJJ getting a pretty major role in this storyline, because when you’re launching what’s looking to be comic book epic, you have to throw some all-time greats in there. Additionally, there may not be a single character in the ASM universe who would react more strongly to a city full of wannabe Spider-Men quite like Jameson. Then there’s Mary Jane Watson witnessing the spread of spider powers and dropping a line about hoping this isn’t another “clone” saga unfolding. I know I’ve previously reacted with a touch of caution about Spider Island because of the prominent role the Jackal – the primary architect of the reviled Clone Saga storyline of the 1990s (more to come on that tomorrow). And while there’s no doubt in my mind that there’s going to be a fair amount of “clone” stuff to be dealt with during this storyline, Mary Jane might as well be speaking for the bulk of ASM’s readership when she makes this joke, and my hope is that Slott purposely threw that line in there to alert the readership that “yeah, there’s clones, but this is going to be different. You have to trust me here.” And for the time-being, I will. And what about all those Spider-Man costumes being worn by the imposters around New York City? Maybe it borders on a bit campy, but I love that kind of stuff. Spider-Man has worn so many costumes over the years that of course, a wink, wink, nudge, nudge to the marketing forces that are often behind that kind of decision-making, is necessary. Perhaps I’m overreaching in my parallels here, but I find it fitting that just as comic book readers tend to run out and consume an issue when there’s something “new” about it like a costume, in the fictitious ASM world, any Average Joe is likely to go to their local big box store and pick up a variant costume (kudos to whoever is mass producing those Future Foundation costumes after only a few short months of existence). I doubt that one of the universe-altering consequences to come out of Spider Island is a reduction in the amount of costumes Spidey wears, but it’s refreshing to read a bit of self-mockery from Slott and Marvel here all the same. Even the very first panel of this issue throws a great nod at one of the ongoing thematic elements of Peter Parker/Spider-Man’s existence – the lengths he goes to keep his superhero identity a secret from his loved ones. Except this time, Ramos does a great job illustrating a classic reverse. 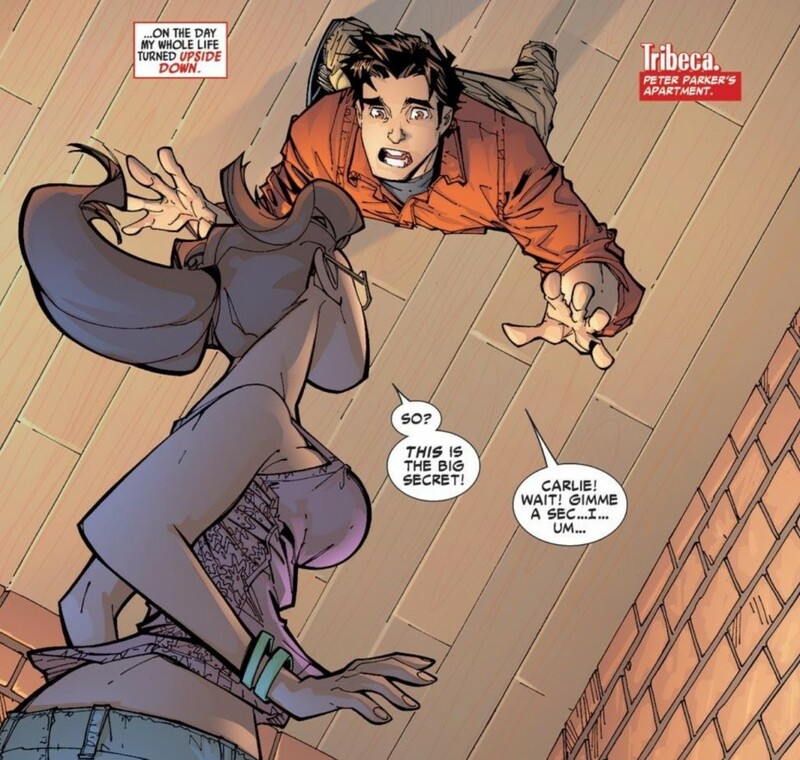 The first thing the reader sees is Peter upside-down, stuck to the top of the panel and his girlfriend Carlie Cooper, right-side-up, accusing him of hiding a secret. In nearly 50 years, how many times have we seen that situation illustrated? Peter Parker on the ceiling, trying to hide from either Aunt May or Gwen Stacy or Mary Jane, or some villain? But on the very next page, Ramos shows that we were actually seeing the world from Carlie’s perspective. She’s inherited the spider powers and is on the ceiling while Peter is walking into the room making the discovery. Loved that. 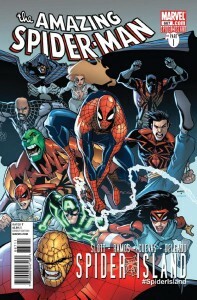 What we’re left with is an issue of ASM that’s just plain fun to read for long-time followers of Spider-Man comic books. I love looking for these hat tips while seeing a new story unfold at the same time. It shows a good balance of respect for your characters and their universe while also trying to boldly push forward and uncover new ground. If Slott, Ramos and Marvel can keep the fun up throughout the next several issues of ASM, I’ll be comfortable with almost any of the status quo changes they may introduce.